Evil cyborgs in golden armour are abducting people from the Barony of Horn, and that ain't right. All trails lead to a mysterious lab on the shores of Lake Michig, but the adventure doesn't end there. To stop the Legion of Gold and save the world, you must boldly go where many have gone before. Strap yourself in and kiss Gamma Terra goodbye - you're headin' to the Moon! 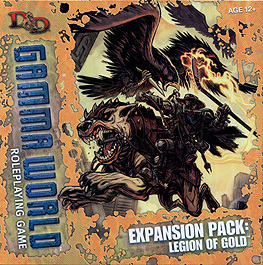 This fun expansion for the D&D Gamma World Roleplaying Game includes new hero options, new rules for vocations and heroic feats, new monsters, and a full-length adventure along with foldout battle maps and card stock tokens depicting various creatures and characters. 160-page book containing new hero options, expanded rules, new monsters, and a full-length adventure.